A little almond and rosemary to spice things up. Is it possible to have a Paleo Thanksgiving? More importantly, is it even Thanksgiving without hot rolls (and the overly stuffed feeling that accompanies it)? Growing up, I would’ve most definitely argued ‘no’ but we’re working on changing that. Last year, I posted this roundup and it really inspired me to see all these amazing Paleo-friendly Thanksgiving recipes out there. So a good friend and I got together (with our husbands who were so kindly keeping the couch warm) for a gluten-free, nearly grain-free, Thanksgiving. We had some bits of dairy sprinkled throughout but zero (!!) hot rolls. And it was definitely a success. While a full-blown Thanksgiving meal is unlikely to happen here in the Bare Root home this year, a celebratory meal is still in order. Having just moved and Jorge having just started a new job, travel isn’t in the plans. And with no family nearby, it’ll just be the two of us, which I am trying to convince myself is just fine. It sounds warm and cozy and romantic in theory but when you’re used to big family gatherings, it’s hard not to feel a little lonely about it. (Sentimental warning…) Thanksgiving means family to me (it means food too but I suppose that comes second). Being thankful for not so much what, but who, we have in our lives. Leaving friends behind and forging out with just the two of us with just a fraction of the whats we had previously has been a bit fat reminder of how much I value those whos. So I’ll be focusing on the one, most very special who in my life this year. 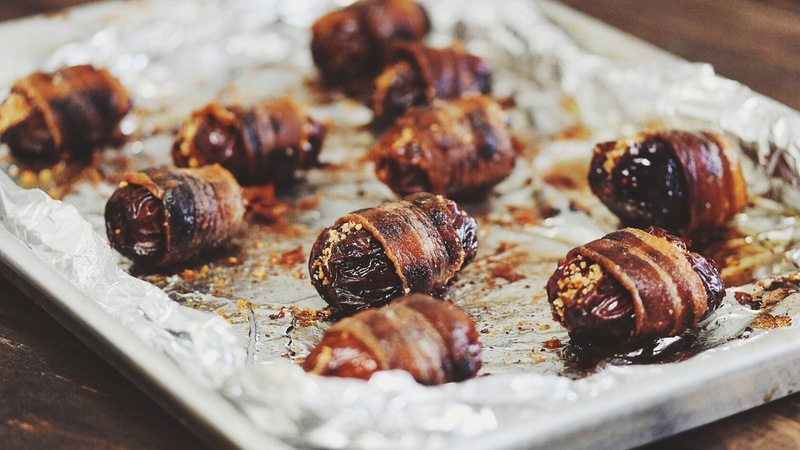 I know there are copious amounts of bacon-wrapped date recipes out there already. I’ve tried them a few ways and settled on almonds, rosemary, and garlic as my favorites for taking them up a notch. Particularly for a celebration, having guests over, etc, I think that stuffing them fancies it up a bit and makes it feel a little more special. Combine almonds, garlic, rosemary, salt, and pepper in a food processor. Pulse until rough crumbles form. Pit the dates and stuff each one with a teaspoon or so of the crumbled almond mixture. Cut the bacon slices in half and wrap each date with a piece of bacon. Place the wrapped date on a tinfoil or parchment lined sheet pan. Bake for 20-25 minutes, or until bacon is crisp. Rotate the dates halfway through the cooking time. Serve immediately. Note: extra of the almond mixture is delicious as a breading for fish or chicken!